Put down the effing lid. Enough already. 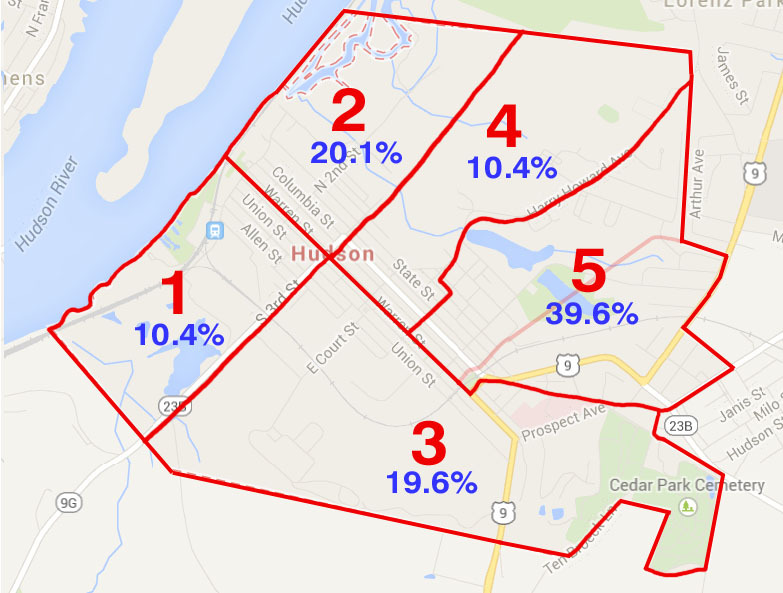 Hudson's five wards have widely varying populations. The weighted voting system used by Common Council is designed to compensate for this, but it appears to be unconstitutional and is thought by some to give disproportionate power to 5th Ward aldermen. Below, I offer some schematic, fairly simple suggestions for achieving population balance. The percentage of the city's population living within each ward is shown in blue; they are my unofficial estimates. Where I've decreased the number of wards, I've suggested additional at-large aldermen. Such changes call for a more extensive discussion, but for now here's a start. Comments: Wards 2 and 4 are combined, as are Wards 1 and 3. Additional tweaking of Ward 5's boundaries would make the ward populations equal. Comments: Wards 1 and 2 are combined, as are Wards 3 and 4. Additional tweaking looks to be more complicated than Scheme A. 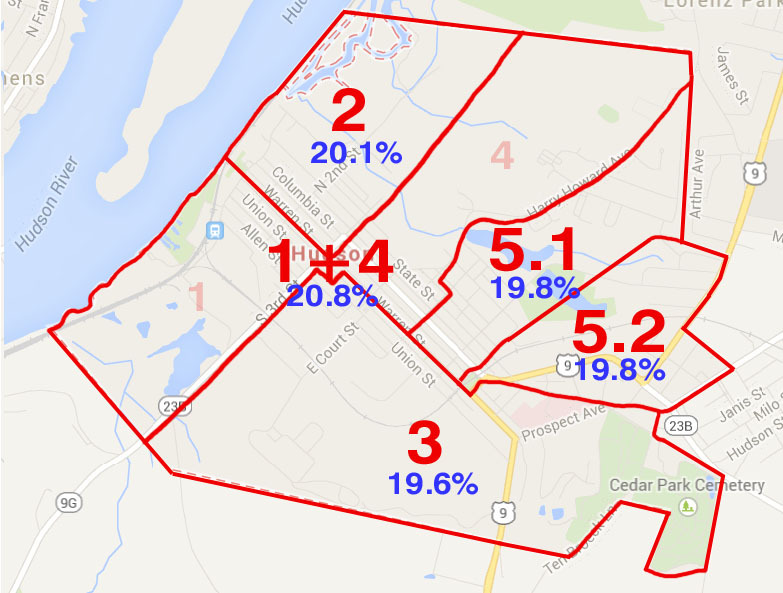 The boundary between 1+2 and 3+4 would need to move slightly east, and Ward 5 also would have to be adjusted. Another possible disadvantage is that the entire waterfront would be contained within one ward. Comments: Wards 1 and 4 are joined; Ward 5 is split. (For expedience I've used the existing internal voting district boundary, but this might not be ideal.) The resulting ward populations are very close, although the configuration of Ward 1+4 appears gerrymandered and improbable. We've all endured the indignity of tripping in public. Chances are, you haven't had it captured by the Google streetview camera, as was the case for this unfortunate Albany pedestrian. Of course, if you fall twice in the space of a hundred feet you increase your odds of being memorialized. The sidewalks look rather devoid of other pedestrians; I hope the fellow got whatever help he needed. The ever active Victor Mendolia will host a session on Hudson's weighted vote this Sunday at 10AM at Valley Variety, 705 Warren Street in Hudson. There does not appear to be a RSVP, so show up if you are interested and bring donuts for the rest of us. I've been slow to grasp the weighted vote issue, and slow to form an opinion on it. I don't know where things settle out for me on it, but I usually learn something by writing about it. So I'll try that here in preparation for Sunday's meeting. If I get some of this wrong, perhaps someone will tell me. Typically, a city's ward boundaries are drawn to ensure roughly equal populations among them. The boundaries are adjusted every few years (ten, I think) to account for population shifts. Each district has the same number of councilors, giving each city resident equally representation in council voting. Hudson's system is different. Our wards have different populations, and their boundaries stay the same year after year. Inequalities in ward population are compensated by applying different multipliers to the in-chamber votes of aldermen (councilors). An alderman representing a large district has a large multiplier applied to his or her vote, while an alderman representing a small district has his or her vote reduced by a different multiplier. As populations shift, the multipliers, rather than the ward boundaries, are changed. In theory, the outcomes are the same. The question is whether our current system is fair in practice. An independent study concluded that Hudson is the only city in the U.S. that uses a weighted vote. Is this a reason to change it? Logically, no. We might be the only city doing it right. (And perhaps our extremely small size for a city makes us a special case.) However, this might not be the most useful approach to take. Does the Fifth Ward have an unfair advantage over other wards? The Fifth Ward is the largest in the city. When its two aldermen cast the same vote, the large multiplier attached to them means they are 72% of the way to achieving a council majority. In some instances, only two other aldermen would have to cast the same vote to give the Fifth Ward its way. In short, four out of ten could create a majority. Keep in mind, however, that those four councilors would represent a majority of the city's population. So technically speaking the equivalent of a one-man-one-vote system would prevail. The question is whether a technical majority truly reflects the will of the populace, or whether some districts get shortchanged under this system, and who would not be shortchanged under a different system. I am curious if the current system has distorted any votes to date, and which future scenarios would produce distortions. I hope Victor will provide specific examples. 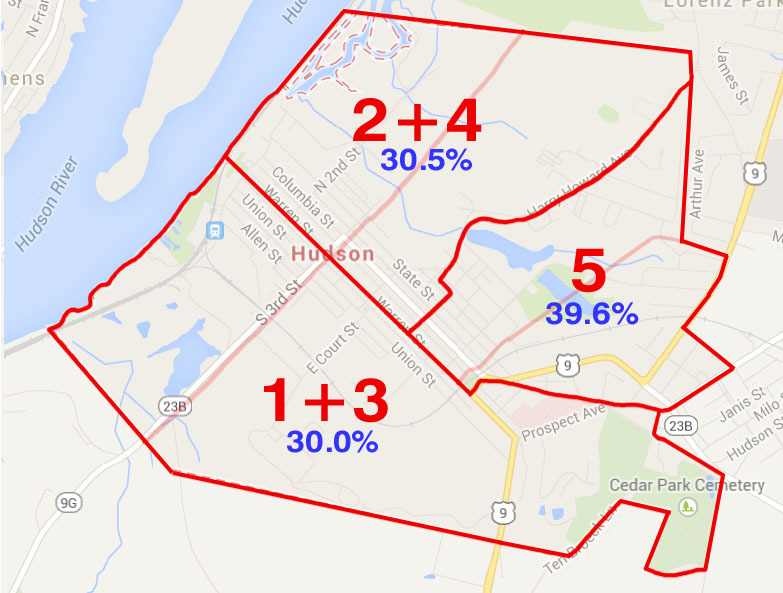 Does the weighted system undermine faith in votes taken by Hudson's Common Council? In Council votes, a show of hands in Council does not necessarily indicate the actual voting result. Calculations must be performed before the exact outcome is known. This might seem to add an element of artifice to the process, even if it is technically accurate. Does the perception of artifice outweigh technical accuracy? Is this perception contributing to the sense of unfairness in the current system? Or is perception itself a significant factor; i.e., is public faith in the fairness of a process as important as, or more important than, the actual fairness of the process? Do the recent errors in counting First and Second Ward residents and the confusion over whether the Crosswinds development is in the Fourth or Fifth Ward impact the weighted vote discussion? It seems to me that these are entirely separate issues. If we are having difficulty correctly counting population within wards, or in agreeing on ward boundaries, we are going to have a problem determining accurate representation under any system. Further, a conventional system would leave us debating not only the population count every ten years, but whether a ward boundary should be in front of or behind a given house. Multiply this problem by several thousand houses, and... oh boy. This probably makes it sound like I am arguing to keep the current system, but I really don't know. What else might be at work here? I think the heart of the issue is that the Fifth Ward is the most suburban of the five wards. Its population seems to have a larger percentage of native born Hudsonians and political conservatives than Hudson's more urban districts. The Fifth Ward therefore might be thought to stand in the way of policies that the more urban parts of the city want to implement. I suspect the real sorting out that needs to be done lies in this terrain. Messy, messy, messy. Or fun, fun fun. Or both. Signed by Rich Hallenbeck; found in a Hudson attic. 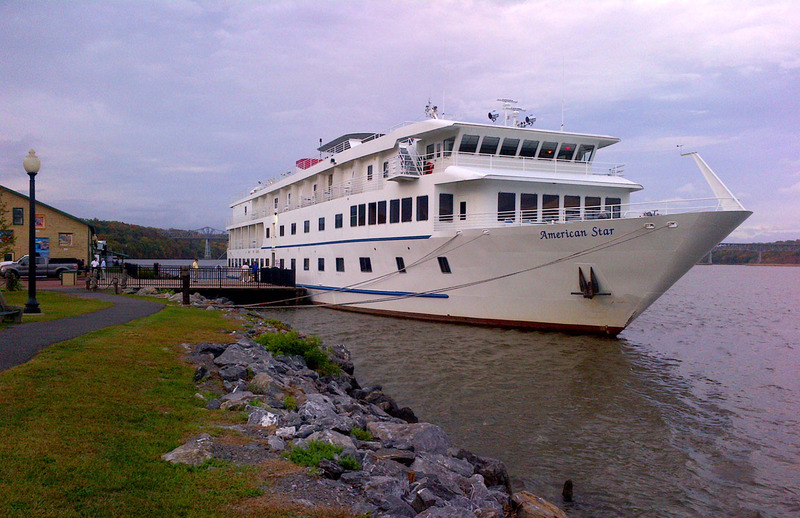 I was surprised to see a large (for these parts) passenger ship docked in Catskill this week. The American Star, operated by American Cruise Lines, hosts two weeklong scenery tours between Manhattan and Troy. Stops are made in Sleepy Hollow, West Point, Poughkeepsie, Kingston, Catskill, and Albany to check out local attractions, including a land run over to Olana. Prices per person range from $3,440 to $5,955, which is shockingly expensive to me, but the leaf peepers on board appeared to be enjoying themselves. A spaceship in the woods isn't everyone's taste, but this example near New Paltz, New York seems as well done as any you are likely to find. Currently used as a bed and breakfast, it's listed for sale by Douglas Elliman Real Estate at $1M. Yesterday I reported that Hudson Common Council is weighing whether to establish minimum apartment sizes in the city. I erred in reporting that the minimum studio size would be 250 square feet. The correct minimum size proposed is 350 square feet. While this alters some of the details of my post, my argument remains the same: the provision will make an entry-level apartment more expensive for some individuals on the lower rungs of the socio-economic ladder. This runs counter to the goal expressed within the proposal, namely to ensure that adequate affordable housing is available in the city. Further, there remains a lack of objective evidence in support of the proposal. The Common Council should reject it. The full text of the proposed law may be found here. Hudson's Common Council will soon vote on a proposal to establish minimum apartment sizes in the city. The proposed standards are 250 square feet for a studio and 500 square feet for a one-bedroom unit. The proposal presumably aims to protect citizens at the lower end of the rental market by guaranteeing more pleasant dwelling units and limiting exploitation by landlords. But on examination, the proposal does not appear to be rationally justified, self-consistent, or helpful to renters. If enacted, it likely will do more harm than good. Most people would agree that a larger apartment is better, all things being equal. But in order to turn such preferences into law, we need objective evidence that people's health and well-being are compromised by living in apartments smaller than the proposed standards. Proponents of the measure have not provided this. If there is any evidence to be found, or at least intuited, on the subject, it indicates that the proposal will threaten the well-being of some individuals on the lower rungs of the socio-economic ladder by increasing the cost of renting an entry-level apartment. Let's look at an example. Recently, the owners of a building at 949-951 Columbia Street proposed creating two apartments within the existing building shell. One is to be a 420 square foot, one-bedroom unit. This unit might be realized before a city-wide minimum is passed, but the situation will come up again, so it's a worthy example. 420 square feet is small for a one-bedroom unit, smaller than many folks would be willing to live in. But a pleasant, livable unit this size can be realized if it has a proper layout. I once lived in such a unit for a year and a half. An informal survey of Trulia indicates that the average apartment in Hudson rents for 1.00 to $1.50 per square foot per month. Using a mean of $1.25, the 420 square foot unit will cost $525 per month. If increased to the 500 square foot minimum, it would cost $625. That's $100 more per month, $1200 more per year that the renter would have to come up with. Keeping in mind that such a unit would attract renters near the bottom end of the rental market, this is $1200 that otherwise might be spent on getting to work or clothing a child. I cannot fathom how forcing such a compromise is a good idea in a city in which around one in four people live below the poverty line. Landlords could face compromises as well. Returning to our 420 square foot example, the owner would have to: 1.) find 80 more square feet within the building; 2.) build an 80 square foot addition; or 3.) remove some existing interior walls within the one bedroom apartment to turn it into a studio. I suspect that at some point in this deliberation, the owner will wonder why city government has inserted itself into the question of whether a renter has a wall between where he sleeps and where he eats. The proposal for a minimum size apartment ordinance in Hudson is not rational, self-consistent, or beneficial to the public it aims to protect. The Common Council should reject it. CORRECTION, 10/15/2014: The proposed minimum studio size is 350 square feet. Please see here. "I think Hudson is turning a corner," a friend said at a party. "The people moving in here are really beginning to make a difference." "I think Robinson is our next up and coming street," said an acquaintance at a community event. "It's the next street in Hudson to be discovered." It's great to see houses and streets being improved, but statements such as these do not sit well with me. They are directed at the surface of things, and ignore the cultural realities taking place, or that could be taking place, beneath the surface renovation of bricks and mortar. There are essentially two ways by which a depressed neighborhood may be physically improved. The first is the way to which we have become accustomed: people with wealth acquired elsewhere move into a neighborhood and fix it up. Stockbrokers and lawyers who make their living in Manhattan buy fixer-uppers in depressed areas of Brooklyn and Harlem. Wealthy high-tech workers from Google and Yahoo buy condos and buildings in overlooked neighborhoods of San Francisco, twenty-five miles north of their work, and motivate their improvement. State government workers in Albany purchase and renovate inexpensive housing in Hudson, while continuing to commute to work in the state capital. Or as has become perhaps more common in Hudson, wealthy Manhattanites purchase and renovate second homes here, and turn them into vacation outposts while conducting the bulk of their lives elsewhere. The second way a neighborhood is improved is when the people already there experience improved financial fortune, and in turn fix up their homes and business establishments. Of the two models, I believe this is the more genuine one, even if its physical results are indistinguishable (by some) from the first. 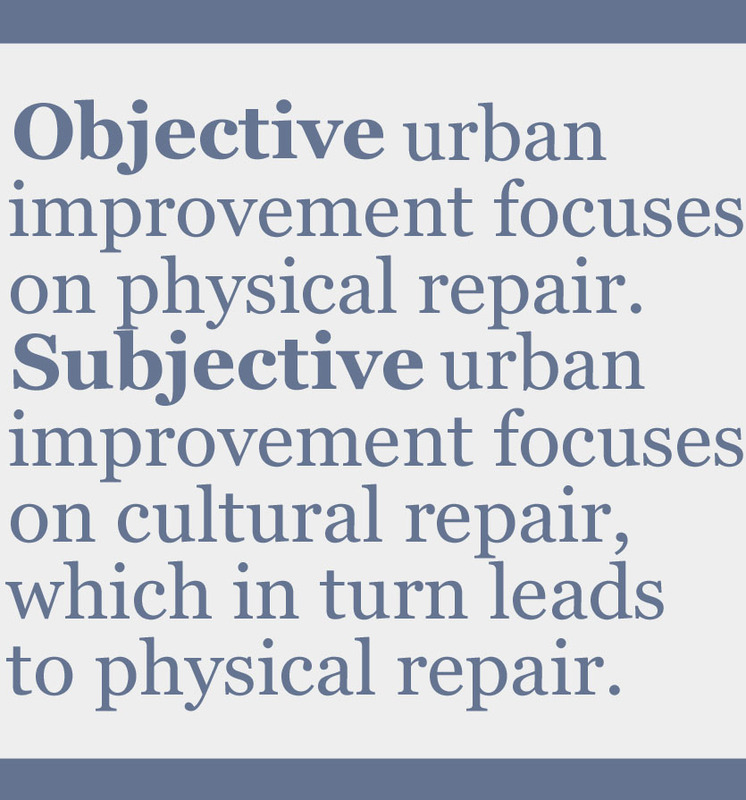 The first model, which I call an objective model of urban improvement, is directed at the physical repair of a place, while the second, subjective model seeks to motivate the physical repair of a place as a byproduct of cultural repair. Hudsonians who are satisfied with the first model are being very short sighted about our city, about the urban problem generally, and about the causes of and cures for America's cultural ills. They don't understand that, comparatively speaking, one isn't repairing much of significance if all he repairs is a building. They don't understand that the embedded problems of a culture are not being addressed when struggling people are forced out of a neighborhood and out of a city just so its buildings can be renovated. All this does is put Hudson on the winning side of a zero-sum game. But so what? these folks seem to think; that is a problem for Troy or Albany or Schenectady to figure out. But I will admit that my friends are right about one thing: the people moving into Hudson are making a difference. They indeed are. Citroen 2CV6, Hudson, New York. Built from 1948 to 1990, the 2CV sold over 3.8 million units. What's the big (or little) idea? Next week I'll be teaching a nonfiction writing class in Boston. It will be held at Grub Street, a remarkable organization that began twenty years ago when a recent MFA grad nailed fliers to telephone poles in her neighborhood and began teaching writing classes in her apartment. Today, Grub Street has several thousand members and each year puts on one of the largest and best writers' conferences in the country, Muse and the Marketplace. My own entry into the writing world has been without benefit of extensive formal training in writing. But there are many parallels in the creative process in writing and architecture, so I often turn to my architectural training for insights. In my writing course, I'll be drawing from one particularly hard-earned lesson from architecture school. In a second-year studio, my classmates and I were asked to design a bookstore. In those days, bookstores didn’t sell coffee, scones, toys, and all the other things they now sell instead of books, so the building seemed quite simple. The site was simple, too: a sea of anonymous suburban asphalt—the Great American Strip, our instructor called it. This wasn’t going to work. Already, I could hear the vacant buzz of fluorescent lights over my neat, parallel rows of shelves. My store didn’t sell books; it peddled ennui. But from my struggles on previous projects, I knew what the problem was: my bookstore lacked an idea. Unfortunately, I wasn't sure what an idea was, let alone how to find one, so what was I to do? I was trying to design a bookstore on the Great American Strip, and there was nothing I could find in the assignment that compelled or inspired anything. All I had to work with were books, books, and more books. I was stuck. When the weekend arrived, I paced my apartment, looking for a way out of my stuckness. I called a friend in the class; he was equally clueless, and perhaps clueless about his cluelessness. After several more hours of pacing, I remembered something I had overheard in school: a good design solution is an eloquent restatement of the problem. I wasn’t sure what this meant, but it seemed to hold a possibility. So I spent the rest of my Saturday restating the problem: I needed to design a bookstore on the Great American Strip. Sunday, more of the same: I needed to design a bookstore on the Great American Strip. Monday… on and on I went. The project was due Wednesday, and by Tuesday I was in a full-blown panic. I needed to design a bookstore on the Great American Strip, and I had nothing. Suddenly, out of nowhere, clarity: I needed to design a bookstore on the Great American Strip. How obvious! What occurred to me in that moment is that in placing a bookstore in a landscape of transmission shops, drive-through restaurants, and adult clubs, I was inserting something of intellectual and cultural value into an intellectual and cultural wasteland. My bookstore needed to embody this. 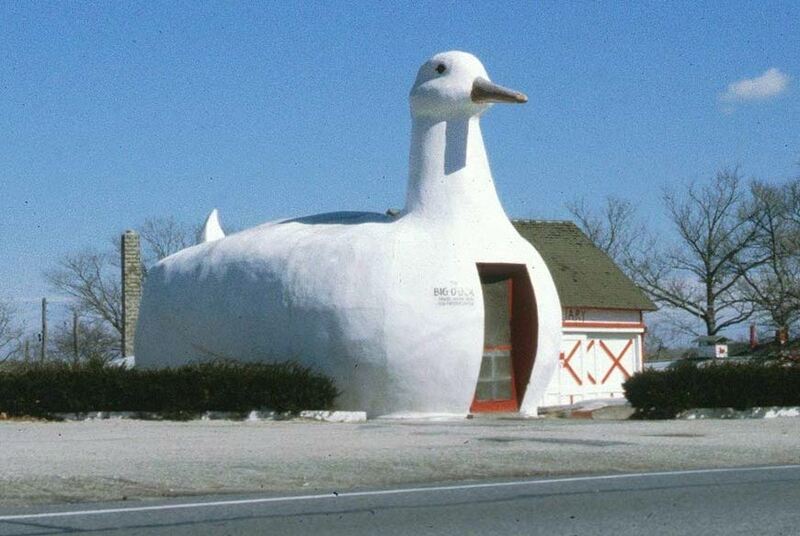 And so, amidst the architectural “ducks” of the suburban strip—a Chinese restaurant with a pagoda roof, a strip joint with blinking breasts, and a Leaning Tower of Pizza—I envisioned my own duck: a classical building conveying, “culture within.” Nothing too serious, but not too jokey either. Perhaps an interpretation of the Tempietto—a beautiful, extraordinarily unified little building in Rome. Tempietto di San Pietro in Montorio, Rome Italy. The possibility was exciting, but the territory felt alien and full of risk. The regurgitation of classical architecture was not rewarded in architecture school, and I had no inherent disposition toward doing so. But I forged ahead. I made a few marks on the page, and a few more, and I nudged things this way and that. Before long, the building was designing itself. A central display room appeared under the dome, with light filtering through clerestory windows. A columned portico provided a transition from the parking lot. Shelves and displays began to fill the facets of the octagonal floor plan. Places emerged for customers to browse and hang out. There were places to sit on the floor. Places to open a large art book. Places to take it all in. I turned a corner as a designer that day. Little of creative value can happen, I realized, without a specific idea to drive and unify one's efforts. The lesson is as true in literary endeavor as in architecture. If you are trying to write a memoir about all the interesting things you have done in your life, you lack a real idea. You’re doing the autobiographical equivalent of lining up bookshelves under fluorescent lights. But if, say, you’re writing a memoir that combines a reflection on your geeky teenage years with a journalistic investigation into contemporary geek culture, I’d say you have a real idea. If you want to write a book on baking desserts for every occasion, you don't have an idea, because you're trying to be all things to all people. But a book on baking cookies for a once-a-year cookie exchange party? That's a real idea. The fear we naturally have in narrowing our creative energies to something so specific is that we won't attract an adequate audience. However, the opposite actually is the case. When we try to appeal to everyone, we end up appealing to no one. But when we narrow our efforts, we increase the likelihood that a particular group of readers will say, "this is the book I've been looking for." This is the case for humor books, do-it-yourself books, travelogues, history books, and every other form of nonfiction. A book needs a unique, informing idea. It needs a specific lens. It needs boundaries. It needs something that tells the writer, and ultimately the reader, what it is about and what it is not about. Do you have an idea for a memoir, cookbook, travelogue, self-help book, or other nonfiction project, but it’s not yet a great idea? Are you knee-deep in a project in which dozens of ideas are competing for space, and you don’t know how to make them cohere? Or do you already have a strong project, but it lacks a certain something that will make it stand out among the hundreds of pitches that agents and editors field each week? This workshop will introduce numerous strategies and writing exercises that will help you discover, broaden, narrow, heighten, deepen, or redefine the core concept for your nonfiction project, with the goal of identifying a singular, clarifying idea that will organize it, tell you what belongs and doesn’t belong in it, and make it “pitchable.” Whether you are just beginning or are feeling mired in a long-term effort, you will leave this session with a fresh perspective on your project.